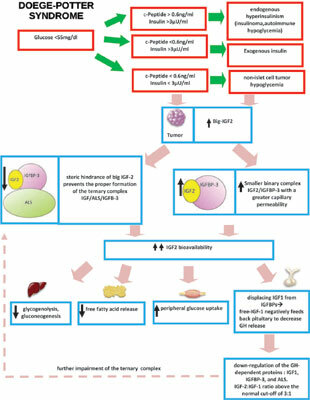 Introduction: Doege-Potter Syndrome (DPS) is a rare but life-threatening paraneoplastic syndrome, characterized by Non-Islet Cell Tumor-Induced Hypoglycemia (NICTH) secondary to a Solitary Fibrous Tumor (SFT), which secretes an incompletely processed form of Insulin-like Growth Factor 2 (IGF-2). Results: A 96-year-old woman was admitted with head trauma due to an accidental fall. During her hospital stay she experienced frequent hypoglycemic episodes. Multiple injections of 33% dextrose and continuous infusion with 10% dextrose were required to maintain normal blood glucose levels. Biochemical analyses revealed hypoinsulinemic hypoglycemia, low C-peptide levels, suppressed insulin-like growth factor-1, normal insulin-like growth factor-2, and an elevated IGF-2:IGF-1 ratio, all consistent with IGF-2 secretion by a non-islet cell tumor. A contrast-enhanced chest and abdominal CT scans showed a single large pleural mass in the left lower hemithorax measuring 15x14 cm without secondary lesions. Histological analysis of biopsied specimens suggested a solitary fibrous pleural tumor; accordingly, a diagnosis of Doege-Potter syndrome was considered. Due to extensive tumor burden and the advanced age of the patient, supportive and non-invasive management was chosen. Dexamethasone therapy was started, and while receiving this therapy she was able to discontinue glucose infusion and successfully maintain euglycemia. Discussion: In the elderly, a sudden and unexplained fall can be the expression of severe hypoglycemia, usually as a complication of insulin therapy or of oral hypoglycemic agents administered to patients with diabetes. However, in patients without diabetes, other causes should be investigated, and the hypothesis of neoplastic diseases should be considered. Conclusion: In this case report we describe an uncommon cause of paraneoplastic hypoglycemia occurring in the oldest patient with a non-islet cell tumor reported thus far. Doege-potter syndrome, solitary fibrous tumor, hypoglycemia, IGF, fall, lower hemithorax measuring.